Warwick New York Hotel Located in the heart of the city, the hotel Warwick New York’s 426 rooms and 67 suites, including our 8 completely unique Signature Suites, each blend in elegant sophistication and comfort. 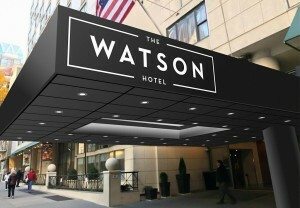 This Midtown Manhattan hotel is known to be one of the most historic hotels in NYC and has hosted many different celebrities throughout the years including "the king of Rock and Roll" Elvis Presley, The Beatles, and Cary Grant who was a long term resident. The renowned media tycoon Mr. William Randolph Hearst commissioned this iconic four-star hotel in 1926 for the love of his life, his muse and mistress the famous actress, Marion Davies. The hotel offers elegant and charming NYC hotel rooms, signature Manhattan suites, and amenities that exude luxury, vintage appeal and modernity all at once. Just like the hotel, Mural’s on 54th is rich with history. This restaurant was named after the murals that cover its walls painted by Dean Cornwell, a famous illustrator and muralist of the early 20th century. Guests can therefore enjoy a delightful and tasteful menu of American fare with the backdrop of the one of a kind murals. Warwick New York is also home to Randolph’s Bar and Lounge, a traditional American bistro style restaurant known to be one of the best places to eat in midtown Manhattan. A perfect place for pre theatre dinner or after work cocktails. The hotel assesses a daily Facility Fee of $25 plus tax for unlimited access to all the hotels amenities. For more information about the Facility Fee and the offerings, please click here. 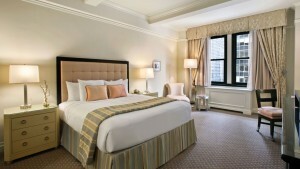 Located in the heart of the city, the hotel Warwick New York’s 426 guest rooms and 67 suites, including our 8 completely unique Signature Suites, each blend in elegant sophistication and comfort. The rooms were designed to reflect the history of the hotel, which have a close tie to the old Hollywood glamour, with a touch of modernism. All accommodations are equipped with the latest conveniences and technologies to satisfy the hotels discerning guests, guaranteeing a convenient and memorable stay with this iconic hotel. These rooms all feature marble lavatories, large work desks with international plug ins, LCD TVs, room service and a fully stocked minibar. Get energized on state-of-the-art fitness equipment including treadmills, stationary bikes, free weights and a stairmaster with personal TV monitors to enjoy your favourite show or music while working out.